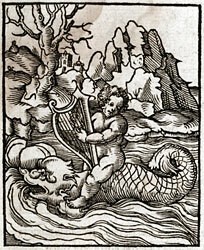 Alciato at Glasgow: Emblem: In Avaros, vel quibus melior conditio ab extraneis offertur. 1. All subsequent Wechel editions have a different picture depicting Arion’s suffering at human hands as well as his rescue by the dolphin.